The text of the Srivisnusahasranama as cited by Sri Sankaracarya has come down the centuries as the authentic text and this commentary of his has proved to be of seminal value ever since. 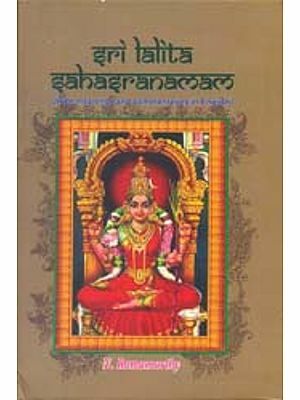 This famous text is an epitome of the essentials of the whole vedic/vedantic teaching and the commentary upon it by the great Sankara embodies his abstruse and subtle style. To afford a clear view of its teaching, the Visnusahasranama has been explained word by word and its sententious import critically examined word by word and its sententious import critically examined by Sankara to teach diverse and sometimes contradictory doctrines of the Vedanta. Therefore, Sankara wrote a brief commentary to determine its precise meaning. The aim of this short treatise is the supreme bliss and a complete cessation of the world-cucle that accrues from that steady devotion to the knowledge of the ultimate reality the lord Visinu and chanting of his names. 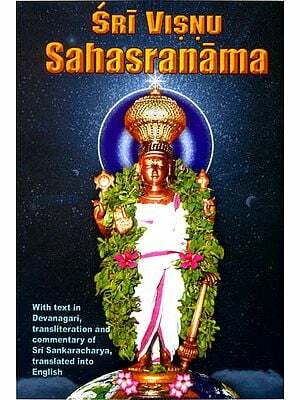 The visnusahasranama and the commentary by Sankara expound specially the nature of the supreme Being and Reality known as Visnu the Parabrahaman forming the subject of the discourse. 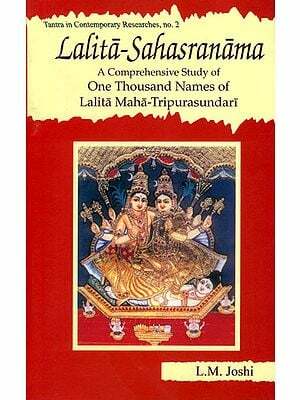 These thousand names of the lord, sermonised by his staunch devotee Bhisma to Yudhisthira in the classic the Mahabharata are compiled in this short treatise. The grandeur of visnu's names is unfathomable and the effect immense. 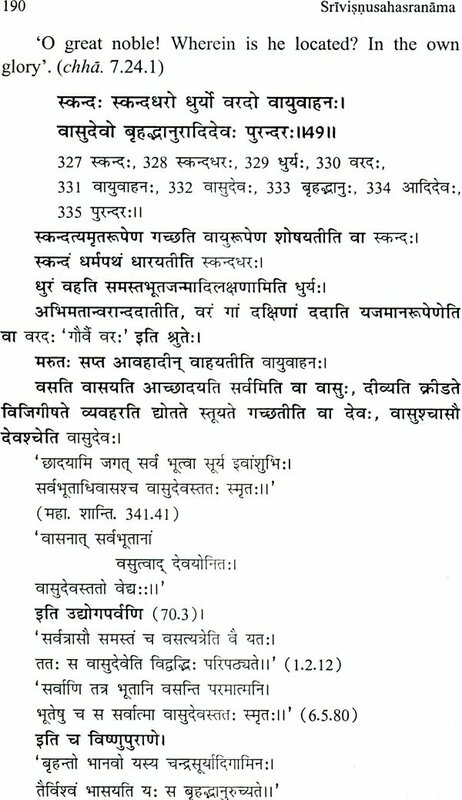 Though lord's names cannot be equated with any examples or metaphors but just to have an understanding the juxtaposition of these denotations by an encomiast like Bhisma results in a highly exotic and unparalleled treatise. 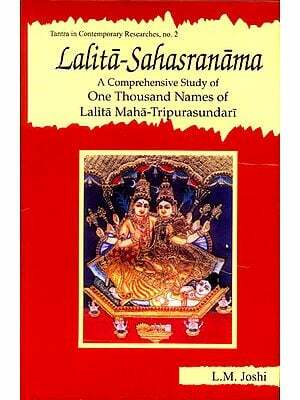 Such name – compilactions and encomiums of the deties like lalitasahasranama or visnusahasranama are not merely rhyming but are arranged by great seers – the knowers of the mysticism of the inner world and also adept in devotion, meditation and practice of Tantra with enchanting dexterity. And this has been executed is such a marvellous manner that verses compiled – are filled with the immense effect of mantras, which if recited or chanted as per the prescriptios of the seers, may procure exclusive devotion to the almighty entailing final beatitude. We have throughout attempted a literal translation of the Bhasya, the text being also literally translated in the light of the bhasya. It has been our special aim to make the Bhasya in its English garb as clearly intelligible to a general reader. Where necessary original Sanskrit terms have been used along with their English equivalents. In some cases Sanskrit terms alone have been employed, inasmuch as their English equivalents are found not to convey adequately the intended idea. The commentary written as it is in Sankara's peculiarly terse and archaic style – presents in several places difficulties. As devotion to lord visnu has been largely associated with the emergence of the mighty and miraculous medieval Bhakti movement that to a larger context, changed the course of the history of medieval India so, we thought it opportune to delineate in brief the origin, development and the design behind the fading of this mighty mass movement. The authors, while groping the interrelationship of visnu and the bhakti movement and tracing the advent, development and decay of bhakti movement, have tried to quote divergent views of scholars and that should not be taken as the personal views of the authors. There always remains much room for improvement in the translation. This has been due mostly to our imperfect command of English. We hope scholars will overlook the discrepancies that may have crept into the book and favour us with suggestions which may be of use to us in our future work. Prof. Tawney's remarks are apposite. 'Translations are seldom popular either in prose or verse unless they depart widely from the spirit of the original. But a certain measure of fidelity to the original even at the risk of making oneself ridiculous, is better than the studied dishonesty which characterises so many translations. Finally, we should here acknowledge our indebtedness to the almighty for always keeping us on the right track. Our thanks are due to Pt. Shri Dayanatha Mishra anastrologer par excellence a retd. Sanskrit teacher and our maternal uncle who was kind enough to inspire us to venture upon this tedious task. We are also thankful to our parents for their constant and pure blessings. It would be ungracious on our part if we conclude without thanking our publisher shri J.P. Yadav for prompt and neat execution of the work. We also thank our principal Prof. S.C. Parihar, a highly spiritual person for his constant support. What we term as Indian culture of Hindu culture, that has long history of immensely diverse, vastly disparate and widely divergent traditions. It would be highly erroneous on our part if we exaggerate the role of any specific trait of Indian culture in developing Hinduism that comprises both a formidable classical heritage combined with a vast range of medieval religious literature especially the devotional poetry. It allowed with much argument in the course of its making. It is not fair to view Indian culture as quintessentially Hindu culture as the contributions of other traditios in its making are immense and so, cannot be overlooked. Rightly has Prof. Amartya Sen remarked in his stimulating trealise 'The Argumentative Indian'. The cultural inheritance of contemporary India combines Islamic influences with Hindu and other traditions, and the results of the interaction between members of different religious communities can be seen plentifully in literature, music, painting, architecture and many other fields. The physical appearance and the nature of lord visnu the deity in the centre of the medieval bhakti movement, also emerge as the combination of Aryan as well as non Aryan traditions, as will be seen in following pages. Liberalism has been its central and inherent trait that applies equally to the origin and development of Bhakti movement revolving around lord Visnu. As vedic visnu is the source of medieval bhakti movement – a movement that changed the course of medieval Indian history. So it is opportune to discuss in brief the various stage of the development and importance of lord visnu generally among the vast Hindu pantheon of gods and particularly among the trinity. In ancient India, as would be discussed later, a god named Vasudeva was worshipped who was later identified with the vedic visnu. Narayana mentioned in the Brahmana literature, was also identified with Visnu whose name came to be associated with Krsna. In the Rgveda visnu is a god of grace. He is however a secondary deity an attribute of the sun and a phase of Agni. 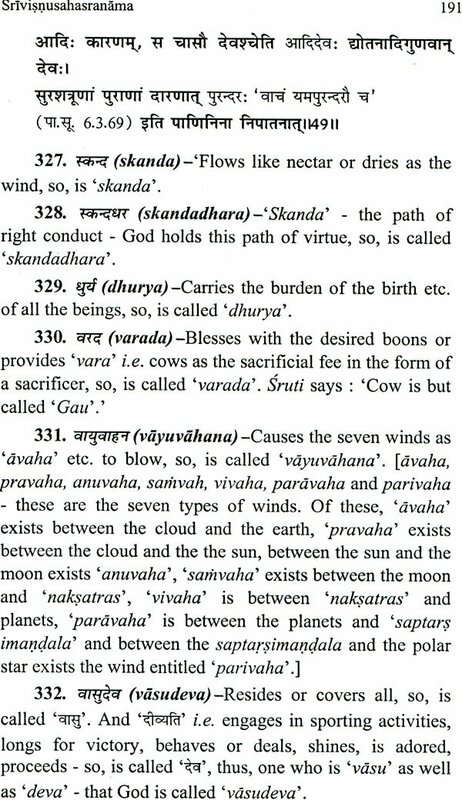 In the Yajurveda, Vishnu finds much prominence than in the Rgveda, Later, in the Brahmana literature there is a growing tendency remarks Prof. Barnett to regard him as a blessed cosmic spirit (Hinduism by L.D. Darnett). In the Mahabharata Visnu is totally identified with Brahma. In the Bhagavdgita, Visnu emerges as the later theism and devotion of the Bhagawata sect and Pancaratra sect base their on the encomium and contemplation of lord Visnu. Visnu the god of mercy and goodness generally contemplated as entirely benevolent, incarnates himself from time to time for the welfare of the world. The cosmic myth of Hinduism depicts visnu as sleeping in the primeval ocean on the thousand headed snake sesa. A lotus grows from his navel there in sleep and in the lotus, is born Brahma the creator of the world. Once the world is crated, Visnu awakes to reign in the highest heaven vaikuntha the god's abode. Lord is depicted as a four-armed deity of dark blue colour, crowned and seated on his throne, bearing in his hands his emblems, the conch discus mace and lotus, wearing the holy jewel 'Kaustubha' round his neck and with a tuft of curly hair srivatsa on his chest. He rides te great eagle Garuda with a half – human face and already associated with vasudeva one of visnu early forms. Let us consider the importance of bhakti regarded as the primary means to the realisation and attainment of liberation. Dissensions still prevail among the scholars of Indology regarding regarding the period of the advent of bhakti in India and also as to the fact that how far the seeds of bhakti were strewn on the land. Having noticed the absence of bhakti in the Vedas on one hand and found some traces of it from the excavations at Mohanjodaro on the other hand, some of the scholars started assuming that bhakti is a non-Aryan element, owing to such differences of opinions and the flickering conclusions, some others have proposed that bhakti in India, basically emerged and developed after the arrival of Islam. So it is pertinent to seek the answers to these queries in a free and categorical manner.